The OUT pin goes high and a timing interval starts when this input falls below 1/2 of CTRL voltage (which is typically 1/3 Vcc, CTRL being 2/3 Vcc by default if CTRL is left open). In other words, OUT is high as long as the trigger low. 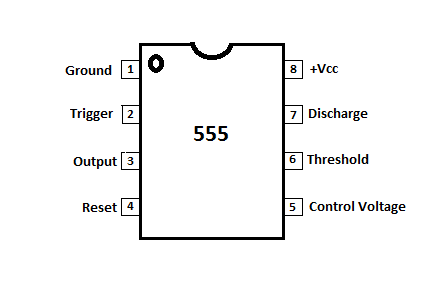 Output of the timer totally depends upon the amplitude of the external trigger voltage applied to this pin. A timing interval may be reset by driving this input to GND, but the timing does not begin again until RESET rises above approximately 0.7 volts. Overrides TRIG which overrides threshold. Provides “control” access to the internal voltage divider (by default, 2/3 Vcc). The timing (OUT high) interval ends when the voltage at threshold is greater than that at CTRL (2/3 Vcc if CTRL is open). Open collector output which may discharge a capacitor between intervals. In phase with output. Positive supply voltage, which is usually between 3 and 15 V depending on the variation.